Spring, summer, winter or fall – there is always the desire to eat soup. When it is made in a slow cooker, you have plenty of time for family, life, relaxation and a bit of work, then at the end of the day you get to enjoy a steaming bowl of fresh veggies and meat, surrounded by the ones you love. This recipe calls for pre-cooked chicken, however if you don’t have any grilled chicken breasts handy or shredded chicken leftovers, then you can add some diced raw chicken breast to the bottom of the slow cooker instead. There is no need to cook it ahead of time, here it is perfectly okay to take the easy route. Soup is enjoyable spoonful by spoonful, but sometimes you want something (anything!) to dip in it. When you are newly trying out a keto diet you may think that your choices are very limited, but that is simply not true. You will just have to try out new recipes, and new ways of eating more vegetables. For example, cauliflower tortillas are a great low-carb food which you can grab on the go, and they are always perfect alongside stews, soups and salads. Instead of making them in rounds you can spoon the mix out flat on the baking sheet and make marks with the back of a knife, so you end up with rectangles or triangles – perfect for dipping. 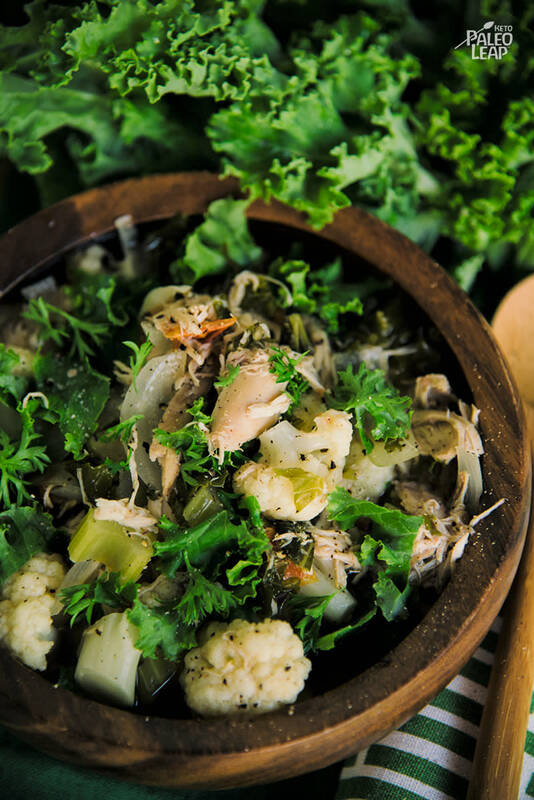 Place all the ingredients in a slow cooker – except the kale. Season generously to taste, cover and cook 4 to 6 hours on low. Add the kale to the soup and cook on high another 25 to 30 minutes, or until kale has softened.